By name, Athena Tacha may be little known beyond the art and landscape architecture worlds, but her work is beloved by many, particularly all those who experience her 50 plus public sculptures first hand in cities across the world. In Greece, her home country, a recent 40-year retrospective brought in thousands. 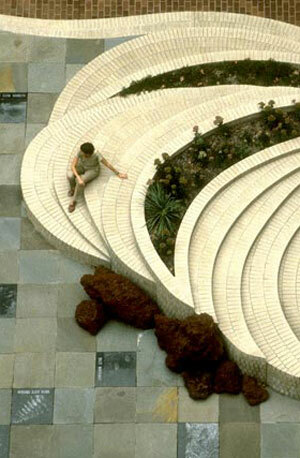 The High Museum in Atlanta also did a major retrospective of her work in the late 1980s. But these days, Tacha, who teaches art at a number of U.S. universities, is no longer creating her unique environmental sculptures, which are so closely related to landscape architecture, like she once did — so there’s even greater reason to save one of her masterworks in New Jersey from the wrecking ball. Created in the mid-1980s in honor of Green Acres — New Jersey’s famed land conservation program — right in front of the New Jersey Department of Environmental Protection building downtown, her work, also entitled Green Acres, is 77 by 85 feet. 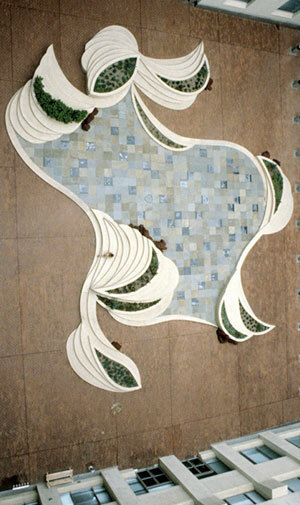 It’s an example of “site-specific environmental sculpture,” an art form Tacha helped create. These kinds of pieces are different from land art found out in the wilderness because they are rooted in social contexts, often taking shape in city plazas and other high-trafficked areas. Tacha out-competed many other artists to get her piece in that place. Winning a competition by the New Jersey State Council for the Arts’ % for Art program, all 1.5 percent of the state’s alloted budget for the environment department building project went to her $417,000 sculpture. Charles Birnbaum, FASLA, head of TCLF, says a number of experts think the sculpture also works perfectly well with its surroundings. On three sides, there are three 7-story concrete buildings; another side is a lane of Sycamore trees, which act as a buffer to the cemetery next door. The work acts a badge for the building, offering a sense of quietude for the cemetery. In April, the New Jersey Treasury Department sent Tacha a letter saying Green Acres was to go by the end of July unless it could be removed on the artist’s own dime. Arguing that the maintenance would be too high and not available in these economic times, the New Jersey Treasury seems at odd with the state’s legislature, which recently appropriated a million for restoration of the courtyard. Seems the crucial piece is that the building’s tenants no longer want it. The New Jersey Chapter of the American Society of Landscape Architects (ASLA) has also stepped up the pressure, telling the state, “We urge you to reconsider your decisions and investigate the potential to restore the paving that is in disrepair instead of completely removing the art piece.” Richard Bartolone, ASLA, the New Jersey chapter president, also argues that “relocation, one of the suggested options offered to the artist, is completely inappropriate as it is a site-specific sculpture; the etchings of New Jersey flora and fauna are uniquely related to the DEP core mission ‘to protect the air, waters, land and natural resources of the state to ensure the continued public benefit.’ The removal of the art work will result in the loss of this significant and defining work of social art.” Basically, you can’t relocate an art work designed for a special place and have it make sense; the work is also embedded into the ground plane. If you want Tacha’s work to stay, let New Jersey know. Write to: Guy C. Bocage, Deputy Director of the N.J. Department of Treasury, P.O. Box 034, Trenton, NJ 08625-0229.